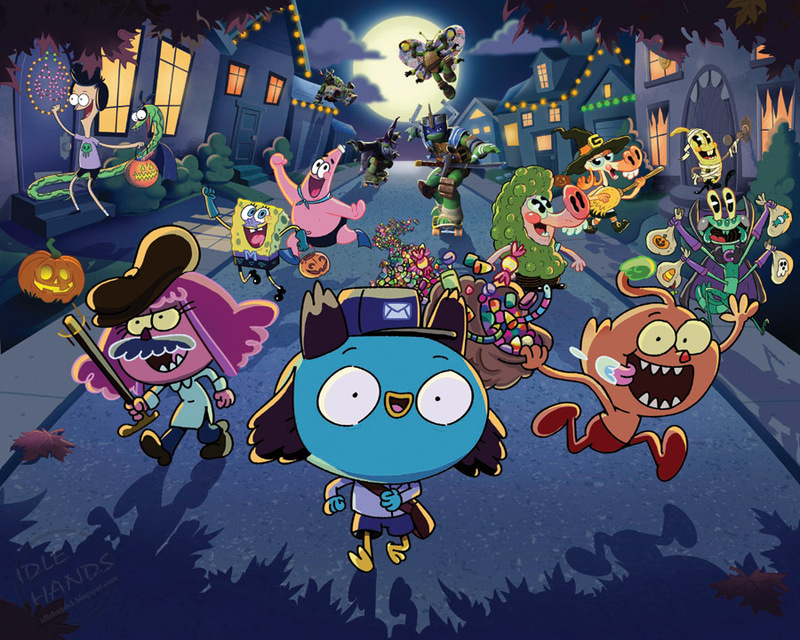 This October, Nickelodeon conjures up a month-long Halloween celebration including holiday-themed premieres and specials from its live-action, animation and preschool series. 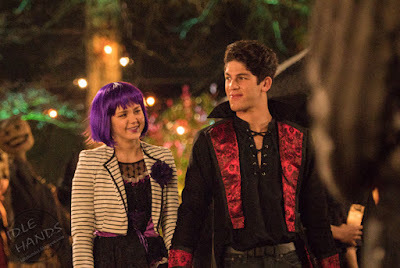 Beginning Saturday, Oct. 12, at 7 p.m. (ET/PT), Nick treats viewers to a fang-tastical TV movie, Liar, Liar, Vampire, starring Brec Bassinger (Bella and the Bulldogs) and Rahart Adams (Every Witch Way), followed by weekly Halloween-themed premieres throughout the month. Nickelodeon also invites viewers to the Halloween Ultimate Costume Party, a 60 minute special debuting Sunday, Oct. 18, at 8 p.m. (ET/PT). Hosted by the cast of Game Shakers, the fest features live music, a costume contest, DIY Halloween tips and tutorials, along with special appearances by the cast of Nicky, Ricky, Dicky & Dawn, Talia in the Kitchen and the WITS Academy. Throughout October, Nickelodeon’s hit mobile apps get into the spirit with bone-chilling updates including new characters, collectible items and Halloween designs. SpongeBob Moves In will introduce a new character, Lord Poltergeist, new costumes and a Spooky Bikini Bottom skin. 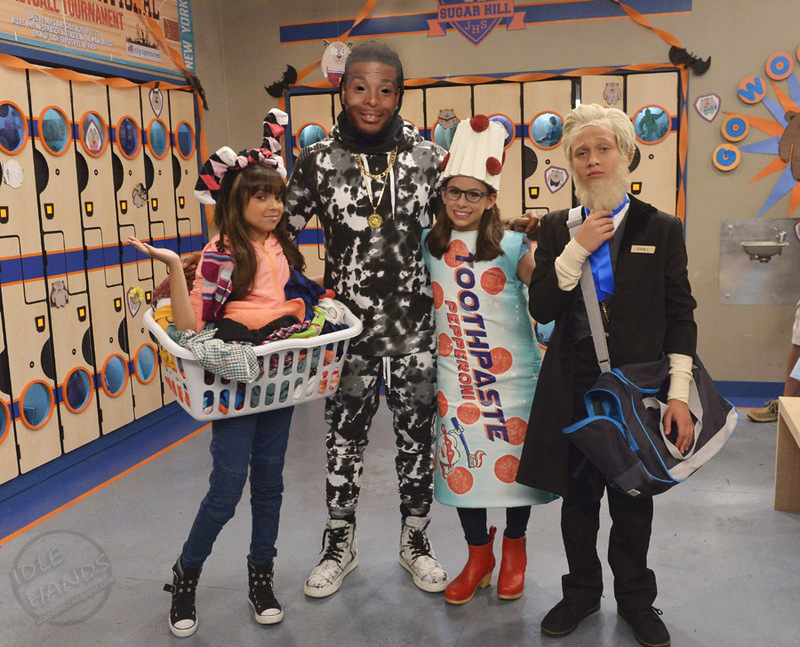 Sky Whale, the recently launched app from the new live-action series, Game Shakers, will feature ten new Halloween-themed collectible objects. Preschoolers will also be treated to new updates on the Nick Jr App and Noggin with themed home screens and video hubs, and Halloween-themed episodes of hit preschool series. Fans can also visit Nick.com/games to access two new Halloween-themed games and a ghoulish update to fan-favorite, Nick Dance Machine, launching Oct. 5. Nickelodeon Trendsetters debuts on Oct. 12, followed by Nickelodeon: OMG, Zombies! on Oct. 19. When introverted 17-year old Davis Pell (Rahart Adams/Every Witch Way) switches schools, mega popular Caitlyn Crisp mistakes him for a vampire. His new neighbor Vi (Brec Bassinger/Bella and the Bulldogs) helps him dial up the ruse and his supernatural persona helps Davis rule the school. As word spreads, the truth becomes harder to hide. Bat Monster kidnaps a costumed Ranger teen from a Halloween Party and extracts memories that will allow her to impersonate them. Kendall must ask the teens test questions to identify the imposter before all of the Energems are stolen. Hosted by the cast of Game Shakers, the 60 minute spooktacular show features live music, a costume contest, DIY Halloween tips and tutorials for kids and families, along with special appearances by the Nicky, Ricky, Dicky & Dawn, Talia in the Kitchen and WITS Academy casts. It’s Halloween in Axle City, and Blaze, AJ and all of their friends are excited to “Truck or Treat.” When Crusher tries to steal all of their candy, his plan goes awry and he sends their treats far away from Axle City. Blaze and his friends must race Crusher to get to their candy first. While helping Gina Giant harvest vegetables from her garden, Wally and Norville meet a garden gnome. His name is Zach, but he doesn’t like his name because he thinks that ‘z’ isn’t a very fun letter. Wally decides to show Zach just how many fun words ‘z’ can make. It’s all going great until Bobgoblin convinces Wally to make a zillion zombie zucchinis who take off with Gina’s vegetables. It’s Halloween and Leah invites her genies over to join the fun. Since everyone is in costume, no one will know they’re real genies!. Zac is competing in a haunted house competition, but he accidentally ruins his own decorations. Leah makes a wish to make Zac’s house look haunted and the genies turn it into a real haunted house, complete with a real live Frankenstein! It’s a spooktacular adventure as the girls try to stop Frankenstein from smashing every Jack-O’-Lantern in Leah’s neighborhood. When Emma accidentally scares off Abuela's cat Lucky on Halloween, Dora and her friends must travel to a real monster mash to save the kitty from a jealous witch. In “Le Corn Maze…OF DOOM!,” After the kids claim that last year’s Halloween maze wasn’t all scary, the Squirrels swear to make this year’s maze the scariest ever. Everyone enters the maze but will anyone ever exit? Then in “Harvey Isn’t Scary,” a Littlebark Halloween tradition involves telling scary stories to keep the boogeyman away, but Harvey can’t seem to scare anyone. If he doesn’t step up his game, they’re all going to be in trouble. Double G has scared Triple G every Halloween since he was a baby. This year, Double G asks Babe and Kenzie to help, but they double‐cross him by telling Triple G his elaborate plan. CJ is determined to fix Principal Hader’s Halloween‐hate in time to rescue the school’s cancelled Halloween festivities. Meanwhile, Crispo and Fenwick deal with costume‐related crises. Phoebe babysits her boyfriend's shy brother, but the mild-mannered boy discovers his evil side when he gets his hands on one of Max's inventions. During Halloween, Troy and Sawyer try to scare the girls at the annual football and cheerleader campout and an urban legend about the school’s old groundskeeper becomes all too real. To save a haunted music theater, the Fresh Beat Band of Spies must help Spooky Spooks, a friendly and energetic ghost who just wants to rock. On Spooky Pumpkin Moon Night, Hazel and the Charmers go to the pumpkin patch to find the best pumpkins to win the contest. In “Trick or Treat Time,” after the twins go trick or treating, they help prepare toffee treats for the Halloween party. In the process, they unleash a giant toffee monster that puts a scare into Tickety Town. Then in “Spooky Time,” while preparing for the Spooky Party, Pufferty is scared by his own reflection and races off into the Spooky Woods. The twins go after him, but they must conquer their own fears to bring him back in time for Chime Time. Shredder and his pals (Tiger Claw, Bebop, Rock Steady, etc.) are teaming up every weeknight for three weeks to terrify the Turtles out of their shells and haunt dreams forever. Beginning October 12, catch a different horrifying mutated villain taking on the Turtles each night, all leading up to a week of Nicktoons premieres uncovering the origins of the ultimate nightmare, Shredder. In Pac-Man 256, The Glitch Bites Back! Funko Horror Classics Mystery Minis Series 2!